How will auto rickshaws (the black-topped vehicles in the center of the roadway) fit into tomorrow's transportation systems in Indian cities? Photo by jaroslavd. In recent years, auto rickshaws have been a topic of endless controversy in India. 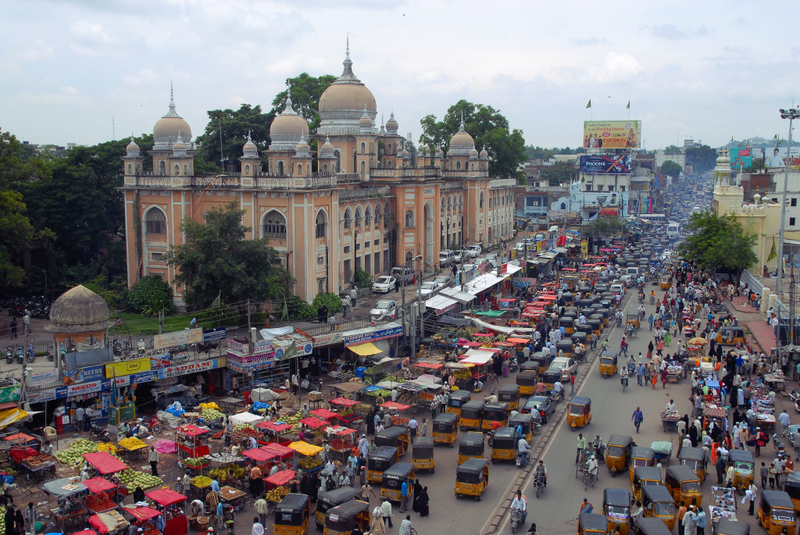 Proponents maintain that they are a vital mode of transport in Indian cities, providing low-cost mobility and connecting travelers to mass transit and even directly to their destinations. The auto-rickshaw sector provides a livelihood for some of India’s poorest citizens. On the other hand, the vehicles are responsible for high levels of CO2 emissions and can be unsafe. As cities like Delhi attempt to develop their transportation systems and simultaneously struggle with increasing car use and congestion, some have adopted caps on the number of auto rickshaws. However, the tide is turning against those regulations. In January, the Environmental Pollution (Prevention and Control) Authority (EPCA) reviewed this restriction in Delhi and recommended its removal. The Authority noted that Delhi’s growing pollution problem is due primarily to the increasing number of private vehicles on the roads, that the best way to curb motorization is to develop a functional public transport system, and that auto rickshaws are an integral part of that system. They provide “last-mile connectivity,” key to shifting motorists to public transit. In reaction, last week, Delhi’s Chief Minister made statements about banning auto rickshaws altogether, citing their contribution to pollution, the lack of comfort for passengers and the rude drivers. She noted that auto rickshaws are a “low standard mode” of transport and not the transport of the future. These statements caused an uproar and led the CM to soften her rhetoric, admitting that eliminating auto rickshaws without providing an alternative would be problematic and discussing a shift toward battery-operated three-wheeled cycle rickshaws. With innovative thinking, auto rickshaws can be “the transport of the future” – and, in fact, may be a crucial part of tomorrow’s transportation systems in Indian cities. As the EPCA pointed out, door-to-door service is necessary to shift motorists to public transit. Banning auto rickshaws will only contribute to the rising tide of car dependence in cities like Delhi and Mumbai. On the contrary, an improved auto rickshaw sector can be a key element of a comprehensive transport system that presents a viable alternative to driving. First, auto rickshaws can become less polluting. Delhi has already converted its fleet to CNG, and advocates claim that this has reduced the sector’s emissions. Similarly, non-CNG rickshaws have been banned in Agra, with police actually seizing offending vehicles. A contest run by Enviu, a sustainability organization based in the Netherlands, exemplifies the potential for innovation in the auto rickshaw sector. Enviu challenged university teams to design prototypes and business plans for hybrid auto rickshaws. The winners, a group of Dutch students, designed an auto rickshaw that runs on liquefied petroleum gas (LPG) , saving up to 26% of energy usage and 53% of fuel costs compared to a conventional gasoline auto rickshaw, and it costs only about $200. This cost savings is a boon for drivers who earn an average of $3-$4 per day. The students are now developing financial plans to get the new vehicles into the hands of drivers. The safety and quality of service of auto rickshaws can be addressed through tighter regulation and the use of technology. The EPCA recommends that the government require auto rickshaw owners and drivers to carry biometric smart cards and public service vehicle badges (the two can also be integrated.) Other recommendations include using technological applications like GPS to improve fare calculation and cut down on overcharging, upgrading emissions testing systems, and exploring different approaches to better integrate the auto rickshaws with mass transit. For example, parking should be provided for auto rickshaws at bus and metro stations. Delhi traffic police have already announced that they will verify auto rickshaw drivers’ credentials, issue badges and biometric IDs, and create a database of drivers’ addresses. This will reduce unlicensed operation and enable authorities to take action as soon as a passenger files a complaint. Officials can also step up their prosecution of unlicensed drivers, which rarely happens today. Groups like the Centre for Sustainable Transport in India (a member of the EMBARQ Network, which produces this blog) are calling for the overall restructuring and reform of the auto rickshaw sector. A coordinated effort to make the business safer, healthier and more financially secure for drivers would reduce accidents and improve customer service. This could include initiatives like driver education, regulated working hours, stricter emissions standards, micro-financing opportunities and insurance policies. As a side note, auto rickshaws are even becoming more stylish, as signaled by Mumbai’s new magazine, Meter Down, created specifically for auto rickshaw riders. The publication was founded by three young entrepreneurs and features short, quickly-read articles to entertain passengers during their trip. For decision makers weighing the elimination of a vital transportation connection against the modernization of the sector to improve mobility for all Indians, the choice is clear. Innovative ideas for the auto rickshaw business are already out there; now it’s time to put them into action.